View Poll Results: Who do you choose? The title says it all. Both have 1955 Topps RCs; both are top-tier HOFers and in the conversations for greatest ever at their postions; both had careers cut short (though Clemente was nearing the end of his career). Who do you choose? Mary Ann or Ginger? Clemente of Koufax? Roberto or Sandy? I'm interested in hearing what the dealers/sellers have to say (though everyone is welcome to chime in and vote) as they should have a finger on the pulse of the demand. So not targeting RCs here specifically. Last edited by Bigdaddy; 04-09-2019 at 10:06 PM. Here in SoCal the answer is pretty simple. Perhaps everywhere with the (possible) exception of southern cal - Clemente! Koufax doesn't come close in terms of collector interest or demand. The only post war player I'm aware of that is ahead of Clemente is Mantle. since you asked - Ginger! full disclose - I don't own the scanned card. Last edited by hcv123; 04-09-2019 at 10:30 PM. Loved Clemente, about as talented and fun to watch as anyone. But I'm a Koufax guy. My father, a Yankee fan for life, took me to see him pitch in Shea Stadium in 65 or 66. 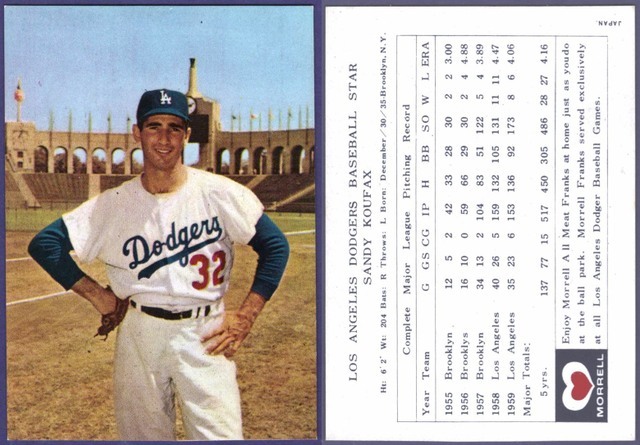 It was a doubleheader and Koufax won the first game. Then, when it was over, my Dad did something he'd never done in all our trips to the ballpark, he said "Let's go." I was disappointed to leave before the second game but he explained that we'd seen Koufax pitch and nothing that day could be as good. When it come to these two players, even the sound of their names has a certain cachet. But I give the narrow nod to Koufax. I think they are both legendary athletes. Koufax, in my opinion, has an undeniable panache and personifies baseball's California cool. However, its Clemente hands down in my house. Baseballs sportsmanship and community service award carries his name. There are also 45 schools and 200 parks named in his honor in places ranging from Puerto Rico to Germany. He is a transcendent figure in baseball and is the Jackie Robinson for generations of Latinos like me. If Jackie Robinson is MLB baseball's conscience, Roberto Clemente is the games patron saint. Last edited by 71buc; 04-17-2019 at 08:53 AM. I think they are both legendary athletes. Koufax, I'm my opinion, has an undeniable panache and personifies baseball's California cool. However, its Clemente hands down in my house. Baseballs sportsmanship and community service award carries his name. There are also 45 schools and 200 parks named in his honor in places ranging from Puerto Rico to Germany. He is a transcendent figure in baseball and is the Jackie Robinson for generations of Latinos like me. If Jackie Robinson is MLB baseball's conscience, Roberto Clemente is the games patron saint. IMO, not even close. "Momen"
That is a tough call - apples / oranges. I never saw Koufax play. I caught the last few years of Clemente's career. Clemente's career last much longer and more quality years, Koufax had about 4 or 5. Both were great in the post season. And were winners on teams that otherwise would of been long forgotten. His legacy will always be more than of Sandy. Therefore, demand will always be higher. Not to take anything away from Koufax as far as baseball or pitching is concerned, but Clemente is bigger than baseball. Koufax is not. A Jewish pitcher in the 50's/60's who bravely stood up for his principles isn't beyond the game??? Come on!!! He said "bigger" than the game and imho opinion while Koufax was a GREAT pitcher who played for a great team and took a stand on a Jewish holiday AND deserves respect, adoration and a whole lot more.......... he was not Clemente. Clement the player, Clemente the Hispanic player, Clemente the player who I suspect faced much greater adversity (how many times did Koufax have to sleep in a different hotel than his team? ), Clemente who consistently and visibly gave back to children, Clemente who died a hero trying to help and save others. C'mon guys, really. How many parks and/or schools are named after Koufax? So only standing up for your beliefs counts if you're the right color?? And I'm glad to know that naming schools or parks after a person is the main thing that counts in your world. Is Thomas Jefferson going to still be considered great after the snowflakes demand his name be removed from parks, schools and other places? Clemente died while trying to get aid to people who desperately needed it. Factoring in the fact he was afraid of airplanes and flying over water, which is exactly the risk he took and the way he died, and the legacy he left really does go beyond the game where people try to hit a little ball with a piece of wood. I have on CD an interview Clemente gave, before the final game at Forbes Field on June 28, 1970. Asked what he hoped to accomplish in baseball, he replied he wanted to get 3,000 hits. That is exactly the number he had when he died. I never understood all the accolades Koufax received for refusing to pitch Game 1 of the 1965 World Series. He pitched Game 2, Game 5, and Game 7, so what difference did it make? I'm not being critical; just noting that Game 1, Game 2, they both count the same. Koufax will be remembered as a great pitcher; Clemente as just plain great, in every single way. And, Mary Ann. Besides being nicer she was also way cuter, even though they couldn't show her belly button. You either want to argue or completely misconstrued/misunderstood what I wrote. Gonna try 1 more time and not make a history lesson out of it. Koufax stood up for his beliefs (rightly so!) in 1 big game! Clemente faced racism most of his career including levels of despicable that I suspect Koufax never had the opportunity to know (that made it arguably harder for him to achieve greatness). Having parks and schools named after you is a sign of honor and respect - I suppose you couldn't find one named after Koufax. Not sure what you mean about the snowflake reference, but I believe the question was about Clemente or Koufax - not Jefferson! Clemente was THE Great One! Thinking about all this, I have a question for Koufax and Dodger fans. Suppose Yom Kippur had fallen on the day of Game 7 of the 1965 World Series instead of Game 1, Sandy had refused to pitch, and the Dodgers had lost? The Dodgers capture a hard-fought pennant by just 2 games, they split the first 6 games of the World Series with their Koufax-Drysdale-Osteen rotation, Game 7 comes up, it's Yom Kippur, and Sandy says he won't pitch. Won't start, won't be available in relief, nothing. Most he will do for his team is clap his hands and offer encouragement. And then, the next spring, he and Drysdale pull off their dual holdout which nets Sandy a $40,000 raise for 1966. How would you feel about Koufax then, had his Yom Kippur day of rest cost his team a World Championship? Clemente faced something that even Jackie Robinson didn't, racism from his home town fans. He was often ridiculed because he was not only black, but Hispanic and didn't speak English. It is often refered to as double racism. He suffered as much as any player in MLB history. In 1969 in San Diego he was kidnapped at gun point and taken into the hills. They put the pistol in his mouth and were ready to shoot him when Roberto was able to talk them into releasing him. Clemente repaid all the hatred directed at him with nothing but love. He gave back to the city of Pittsburgh and to his home island of Puerto Rico. He gave his life trying to save suffering people in Nicaragua. He is the example that Hispanics look to, now over 30% of MLB. There is no one that you can compare to Roberto Clemente when it comes to on and off the field. I grew up in LA in the 60s when Koufax was at his peak. He was known as the left arm of God. In my opinion, he is the greatest left handed pitcher of all time. I have no doubt that if it wasn't for the arthritis in his left arm, he would be regarded as the greatest pitcher of all time. He put together the greatest 5 year run in MLB history while being less than 100% most of the time and missing big parts of two of the seasons. He is nothing but a class act, but he never could have the impact of Roberto Clemente. Good points, all. Again, I didn't offer an opinion on who had it worst (obviously, it was probably Clemente). I simply bristled at the fact that some people don't seem to understand what types of problems a Jewish pitcher faced at that time. (I'm from NYC and Long Island, and have a lifetime of experience with the crap my friends, relatives, girlfriends, etc. went through on a daily basis. And I've celebrated countless Chanukahs, Passovers, etc., in my life and sat Shiva way too many times.) My problem is when that other self-absorbed dipsh_t comes on and laughably attempts to condescend to me. Yes, but it was Clemente that was kept off the Dodgers roster because of his heritage while Koufax was given a roster spot for 2 years in which he barely pitched. The Dodgers were forced to keep him on the roster for that amount of time because he signed for a bonus. That was the rule back then. In fact when the Dodgers and Sandy & his dad agreed to terms, the first thing the Dodgers had to do was get rid of a player to make room on the roster for Sandy. Everybody knew he wasn't big league ready, but the Pirates, Giants, and Braves were after him too, so that's how the Dodgers had to play it. Like Mary Ann or Ginger.